Long-lost London Bridge — the medieval structure that once spanned the capital’s River Thames, is still revered for its beauty and functionality as an extension of city life and commerce with its houses and shops. The still-standing medieval Ponte Vecchio in Florence, Italy gives us a glimpse of what London Bridge must have been like and is one of the city’s most stunning pieces of architecture. 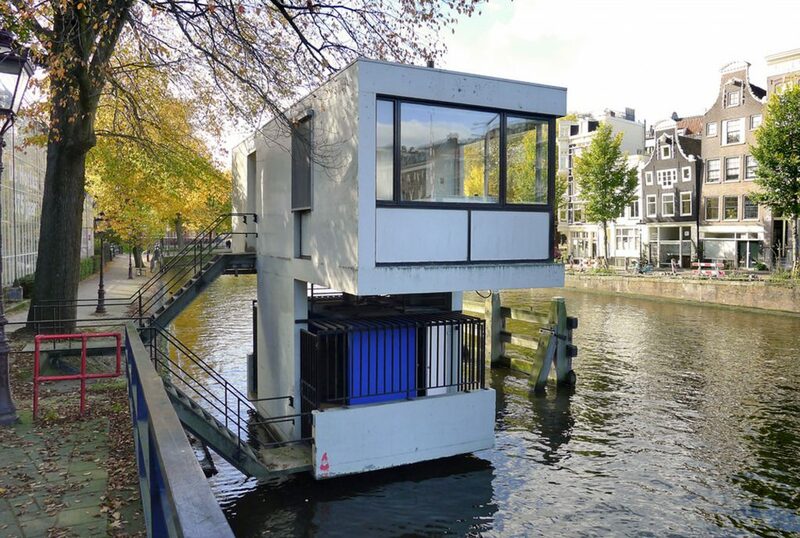 Architects often incorporate multifunctionality into their designs and bridges are no exception. Here we bring you a selection of bridge projects, both real and conceptual. Located in the breath-taking Faroese landscape, the 750m2, green-roofed town hall of Eysturkommuna merges with nature, bridging the river in the village of Norðragøta. The building, designed by Scandinavian Henning Larsel Architects, takes its cues from a time when the village was an important part of the local fishing industry and its beaches the natural focal point and gathering point of the community. The town hall is the first of more planned buildings to reclaim public life in the centre of Norðragøta, serving the wider Eysturkommuna community of some five villages that are home to 2000 people. The terraces and roof are open to the public for picnics and swimming in the river. A sound and light installation created by artist Jens Ladekarl Thomsen, based on the sounds and structures found on the islands, is installed alongside the building. SWEETS hotel is a radically different way to experience Amsterdam, created from what were once the homes of the city’s bridge keepers. For 100 years the bridges’ keepers were responsible for opening them for passing boat traffic. The introduction of a centralised bridge control system made the bridge houses, and their keepers, redundant. Now they’ve been transformed into bijoux hotel suites by a dedicated team of architects, designers, builders and artisans led by Amsterdam-based architecture practice Space & Matter. Some bridges were never built to last. In approximately two years’ time, what was an abandoned, polluted canal will once more flow as the river it originally was thanks to a long project to restore it to its natural state. The Emscher River is a tributary of the Rhine and sits in a vast industrial area, which has used the river as an open-waste canal, rendering the actual ‘river’ almost biologically dead. Since the 1990s a huge renaturation project has been in the works to rehabilitate it. The project is expected to cost several billion Euros and be completed by 2020. 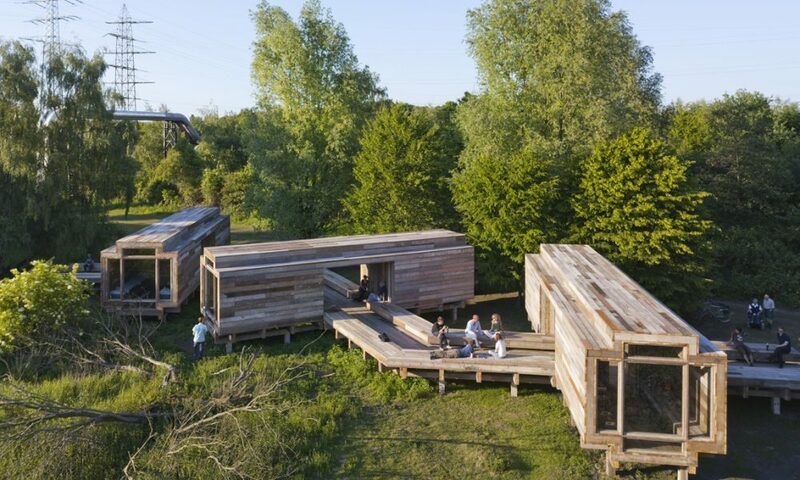 In celebration of the ‘renaturification’, the Dutch art group Observatorium built a 38m, habitable wooden bridge from reclaimed timbers to span the space where the river will eventually flow again. For the summer of 2010, Warten auf den Fluss (Waiting for the River) was open to visitors and overnight guests to explore the river bed. The structure included dormitories and outdoor eating areas. The Zaragoza Bridge Pavilion, designed by Zaha Hadid Architects is an ‘experiential’ bridge that includes ‘pods’ that are both parts of the structure and exhibition and performance space. Located above the main floor level, the Bridge Pavilion connects with each river bank via a smooth inclined terrain. Each ‘pod’ is located on the same level, except one, which is 1.5 meters above this main level and intersects with its adjacent pods. 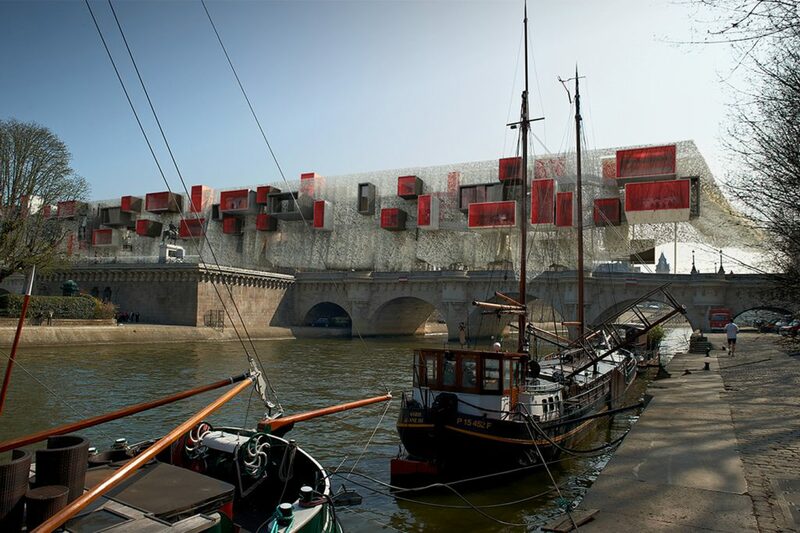 A never-realised concept for creating a useable structure above a bridge in Paris was the brainchild of the Stephane Malka studio in France. Its ‘nomadic micro-city’ was constructed of a modular system that could be quickly assembled and disassembled in various configurations.